It was Mom’s birthday this month so Pretty Sis and I took her and some other family members to a place interestingly called Cork and Fin in Gastown. I guess by that name it means they specialize in wines and seafood?? They are a participant of the Let’s Go For Dinner program which gives you 50% off dinner certificates. Use my referral code (RAF315892) if you are interested!! The entrance is quite inconspicuous as it doesn’t really have the restaurant name stand out. But it’s also not hard to find. The staff is actually very, very nice and helpful. We were originally seated near the door in the middle of the restaurant, but knowing our Asian parents, they don’t like that. So we asked for a more intimate booth near the back of the restaurant. The staff were extremely nice about it and accommodated us well. Another thing was, our aunt is a vegetarian, but they obviously didn’t really have strict vegetarian options here, so once again we made special requests and again the server was very helpful with his suggestions. The bread, however, took quite a bit to arrive. It wasn’t served warm as I would’ve preferred but it was soft and fresh. 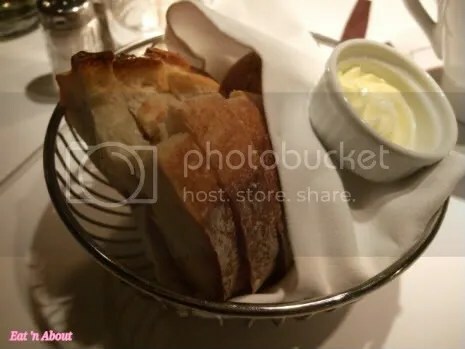 I think it’s just regular bread as it didn’t taste much like sourdough to me. A thing to note though is that this is mostly a share-plate type restaurant, so don’t expect big portions. Now my aunt is quite the finicky and picky eater. 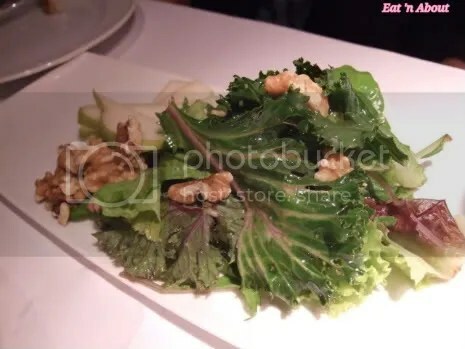 We sort of picked for her the normal Market Salad which came with walnuts, pear, and a creamy gorgonzola dressing. That actually sounded pretty divine to us however PS and I both knew without asking that she will complain about the intense (and delicious) flavor of the gorgonzola, so we just asked for the dressing to be changed to a regular lemon and olive oil one. PS, Mom and I are more the foodie types. We ordered the small Seafood Tower to share. 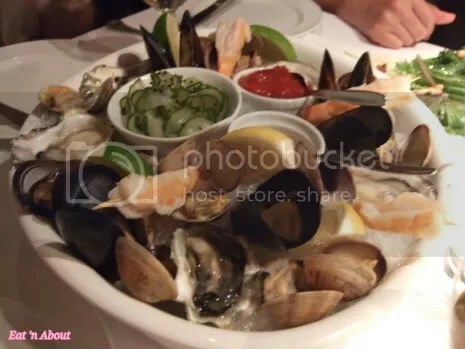 It was a good deal at $33 and it came with 4 portions of cooked clams and mussels, raw oysters and cooked shrimp. Everything was very very fresh, especially the oysters, with its rich and flavorful brine it was easily the best part of the tower. My next favorite were the fat mussels, which were both sweet and rich with such a satisfying bite. The clams were ok, decent sized but not much to say in terms of flavor, and the shrimp was like a regular shrimp cocktail type thing. The tower was served with a cocktail sauce, a garlicky lemon vinagrette, and a cucumber sunomono (which was just alright. Presented well though.). 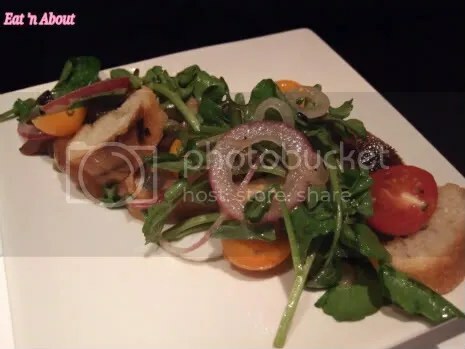 Uncle G ordered from the $30 Prix Fix Menu, which started with this Panzanella Salad which is essentially a “bread” salad. As he is also a picky eater we already expected a complaint and he did not disappoint this time. He complained that it was too sour. I didn’t try it but I’m sure it’s fine. Uncle G’s second course was a Shrimp and Crab Bisque. It didn’t look especially awesome so no picture was needed. He complained it was a small portion. 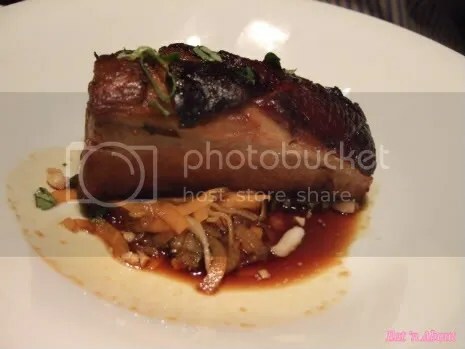 For the main he chose the Pork Belly accompanied by asian vegetables. I guess like most older Asians they prefer food that are, well, more “Asian”, so this was one he did not complain about. In fact he quite liked it. For the rest of us, that being PS, Mom and I, we enjoyed every single other thing we ordered. 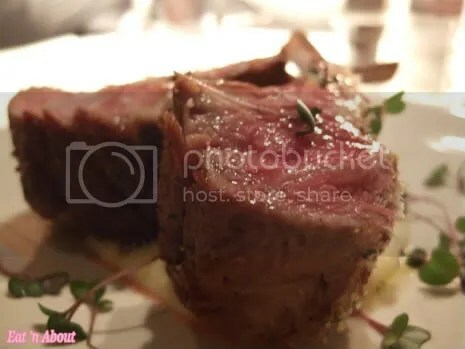 First was the Rack of Lamb which was so succulent and juicy and flavorful and full of melt-in-your-mouth goodness. It was cooked to the perfect doneness and we only wished we had more. Next was the Smoked Sablefish in poached in milk and grainy mustard. Boy was this good. 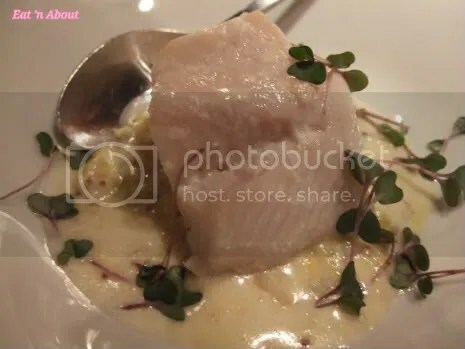 I’ve always loved Sablefish and I loved this. The fish was tender, moist, and the sauce was light and creamy and fit the fish very very well. 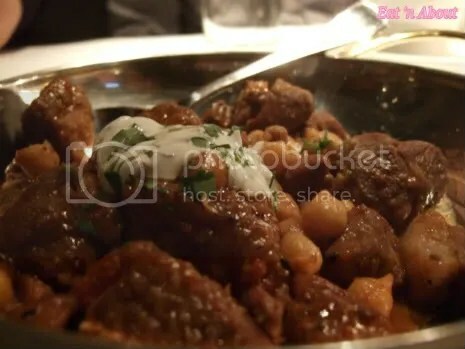 The Braised Lamb with harissa chickpeas had an Indian flavor to it. The lamb again very tender but aside from that it’s not that special. Definitely not my favorite of the night. 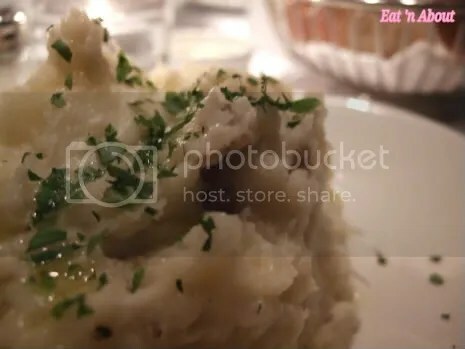 As the food were mostly small plates we ordered a filler side and that was the Dungeness Crab Mashed Potatoes. It was buttery but we couldn’t really taste the crab. But Aunt, I guess because of her “heightened” sense of anything meat-related in her food, claimed that she could taste slivers of crab meat. Whatever..
We actually also ordered the Tuna Steak but I guess I forgot to take a picture of it. It was really good, but I give that credit to the tapenade that was served on top. I don’t quite know what was in said tapenade but it really gave a lot of flavor to an otherwise flavorless fish. So obviously I enjoyed this meal very much and would definitely come back! My only gripe would be though that it takes quite a while for the food to arrive, so be prepared to have lots of good conversations going!